The heart of the Rogue's performance starts with its engine. The 2.0L 4-cylinder engine that can achieve 141 HP was designed to be highly efficient. With its ability to obtain 32 MPG, the seeks to keep you out and about visiting the places that you want to see rather than spending time filling up the gas tank. 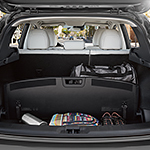 Another benefit of the Nissan Rogue Sport is how it handles. Different environments and situations may call for driving in different ways. The Rogue has drivers covered by providing two driving modes. Eco Mode makes adjustments to the engine and transmission to get the best gas mileage. Sport Steering, on the other hand, lets drivers tackle the road more playfully by increasing steering response.